Windmill Villas is a fascinating complex of residences, built around an old windmill, which is known to the locals as "Spithas’ Windmill". According to the marble plate, which is set over its main entrance, it was built in 1854 and it is the biggest of all the windmills of Sifnos (there were 60 on the island). The building has been listed by the Greek state, and has been completely renovated in 1989. Ever since, it operated as a lodging to let, formed in such a way that, at any time, it can still operate as a windmill, once it has its windmill sails back on. 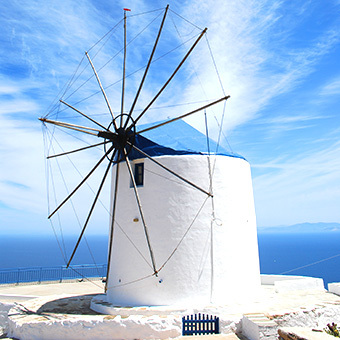 The windmill was named after its owner, Mr. Kostas Spithas, who will welcome you with his wife Rita, and they will both make your stay in Sifnos unforgettable. Windmill Villas is situated in the village Artemonas, and it consists of the traditional windmill and of seven more lodgings that are built next to it, harmonically incorporated into the environment. All the lodgings have a view of the village of Kastro, of the islands Paros and Antiparos, while you can also see the islands of Folegandros and Sikinos. All the lodgings have a telephone, a television and an air-conditioner. We provide daily cleaning service and bed linen and towels change every three days. Finally, the complex has a parking site for the vehicles of our clients. 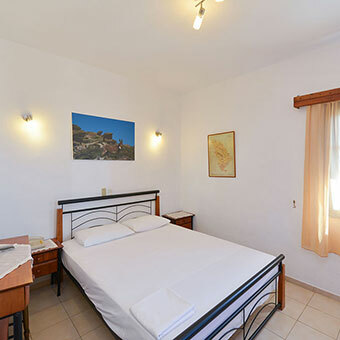 Our lodgings are situated at the highest spot of the aristocratic village of Artemonas. All the rooms have an incredible view of the Aegean Sea and of the village of Kastro, while you can also see the islands of Paros and Antiparos. On sunny days, you can also see the islands of Sikinos and Folegandros. Read some of the most characteristic comments about our unit, confirmed by booking.com.